Carpenters Mate is the original hex head self-drilling screw supplier in the UK, manufacturing and supplying innovative hex head screws to industry professionals for over 20 years. We aim to help tradesmen complete their projects quickly and efficiently with our quality, durable and self-drilling timber fixings designed for carpenters, by carpenters. 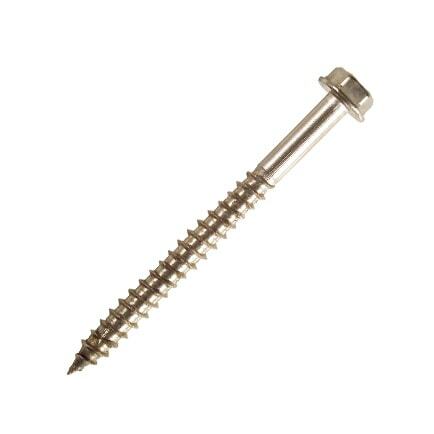 Our screws can be used for loft and roofing projects, landscaping and any other timber structure project. Pro Hex Head Screws 6.3mm - A high-quality carbon steel screw, which can be used in almost any timber application. 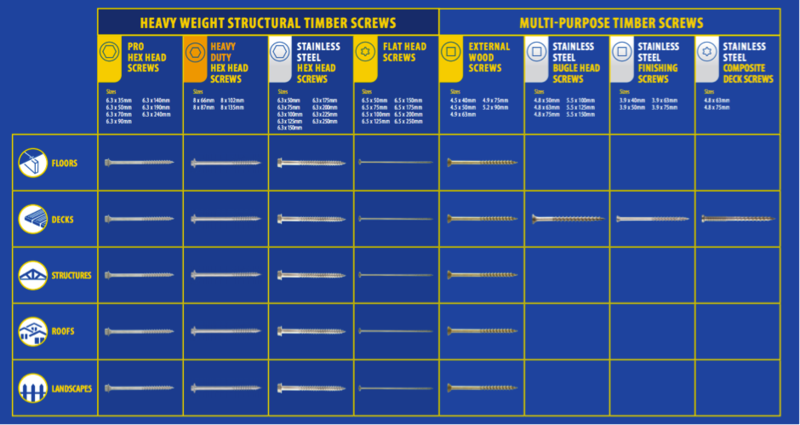 These screws come in a variety of specific lengths to support the UK’s timber sizing. HD Hex Head Screws 9.5mm - Our HD (heavy duty) hex head screws are made from high-quality C1022 steel complete with a wide washer head to help spread the load. These heavy-duty, self-drilling screws are perfect for fixing structural timbers with high loads. 316 Stainless Steel Hex Head Screw 6.3mm - These screws have been designed and manufactured to be tough and durable for longevity, without risk of corrosion. Our screws come in two diameters and a range of lengths to support every application. ​​​​​​Can't find what you’re looking for, find out which screw is right for the job here. The Carpenters Mate range of premium-quality, self-drilling wood screws and accessories have been tried and tested by carpenters and tradesman and have been rated as some of the most durable and dependable screws on the market. Our hex head wood fasteners have been designed with efficiency and quality in mind. Our Pro Hex and HD hex head screws are manufactured using C1022 steel, case-hardened and coated in Geomet 500™ for maximum durability and longevity. The type 17 point enables fast drilling and a clean finish. If you’re looking to reduce the overall time your structural projects take - as well as improve the cost efficiency - order a box of Carpenters Mate screws today. Carpenter Mate hex head screws are a direct replacement for the M10 coach bolt. The conventional way of joining two or more timbers together involves drilling a pilot hole, hammering a bolt through and securing the joint with a washer and nut. You’ll know how difficult to it is to access both sides of the timber using this traditional method, as structural projects often involve working in tight spaces. A hex head screw significantly improves the efficiency of this process. With a Carpenters Mate self-drilling screw you do not need to pre-drill or use additional bolts and washer, meaning you can quickly secure your timber structure with access to the joint from one side only. With a free drive tool in every pack, you’ll also use fewer tools and components. Our screws ensure a secure yet flexible connection to accommodate structural movement. The excellent structural properties and corrosion resistance of our screws will ensure longevity. The connection is just as strong, if not stronger than traditional coach bolt connections. Why not request a free sample of premium Carpenters Mate products to try them out for yourself? Simply call us on 0845 241 9862 or fill out a form to receive your free sample, and you can see for yourself what all the fuss is about. If you’re wondering how many Carpenters Mate Pro Hex screws you need per joint for your loft conversion, you can end the struggle of guessing with help from our CalcuMate App! This easy-to-use loft converter tool calculates the number of Carpenters Mate Pro Hex Screws you need for each joint or connection - saving you both time and money, helping you meet industry standards. You can also use our online ‘multiple member spacing tool’ to easily find out the space needed between each Pro Hex Head screws for multiple member connections. To find your local distributor to order a bulk or single pack of our Carpenters Mate premium wood screws and fasteners, click here. You can also find your local distributor by contacting us online or calling 0845 241 9862. We work with over 3,000 distributors across the UK and you too, can also become a distributor.